Mathew Hayman (born 20 April 1978) is an Australian professional road bicycle racer for UCI ProTeam Orica–BikeExchange. Hayman is an experienced and respected domestique, as he typically takes on a supporting role within his team. Hayman is a specialist in the cobbled classics. Hayman left Team Sky at the end of the 2013 season, and joined Orica–GreenEDGE for the 2014 season. On 10 April 2016, he won Paris–Roubaix, the eighth professional victory of his career. On the final sprint at Roubaix Velodrome, he beat Tom Boonen, Ian Stannard, Sep Vanmarcke and Edvald Boasson Hagen. His first reaction was one of disbelief: "I can’t believe it [...] This is my favorite race, it’s a race I dream of every year. This year I didn’t even dare to dream." 1 2 "Hayman transfers to Orica for 2014–15; Plaza, Lastras extend with Movistar". VeloNews. Competitor Group, Inc. 21 August 2013. Retrieved 21 August 2013. 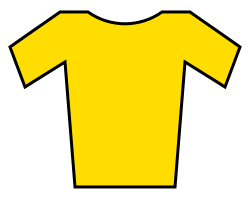 ↑ "Sky Procycling (SKY) – GBR". UCI World Tour. Union Cycliste Internationale. Retrieved 14 January 2013. ↑ "Hayman wins Paris-Roubaix". VeloNews. Competitor Group, Inc. 10 April 2016. Retrieved 10 April 2016. Wikimedia Commons has media related to Mathew Hayman.